Los Angeles’ rail system plans to step up its security efforts by deploying body scanners on its network of 93 subway and light-rail stations. In doing so, it’ll become the first mass transit system in the U.S. to undertake such measures. But when they’re introduced later in the year, the machines won’t become a permanent part of a station’s infrastructure. Instead, the city’s Metropolitan Transportation Authority has decided to use a small number of the portable trunk-sized scanners, moving them between stations as and when required, the Associated Press reported. In other words, you can expect to see them set up at a station where a big sports event is being held, or when there’s a protest in the area, or other occasions where a large numbers of people are expected to gather. The authorities point out, however, that the machines could potentially appear at any location on the network. British security technology company Thruvision, which makes the $100,000 scanners, says the kit can be set up and activated in just 15 minutes. As with regular security scanners, the machines are capable of performing full-body screenings of people, checking for things like concealed weapons and explosives. 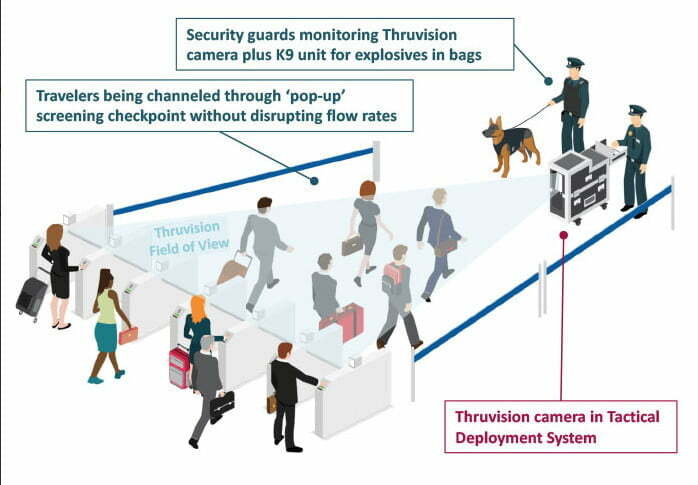 But unlike airport machines, Thruvision’s system can monitor moving crowds of around 2,000 people every hour, with no need for individuals to waste time getting in line. Indeed, the system’s efficiency was key in making the proposal a reality. The technology is said to be capable of identifying suspicious items at a distance of up to 30 feet (9 meters), giving officials enough time to pinpoint, monitor, and perhaps question a person of interest. Metro security chief Alex Wiggins told the LA Times that the kit would be used to prevent what he described as “mass casualty” attacks. In other words, they’ll be focusing more on searching out assault-style rifles and explosives rather than smaller weapons. He added that the authorities will adhere to the 4th Amendment, making it “very, very clear” that a scan is about to take place. Whether such a notification will reduce the effectiveness of the system remains to be seen. Thruvision’s technology, which has been in operation for a number of years, is based on research work undertaken by the U.K.’s Rutherford Appleton Laboratory and the European Space Agency, and identifies objects via the natural electromagnetic rays that they give off. Tanzania electoral body demands proof of violence from US.